The interior design and renovation specifications for the International Plaza Hotel included 142 Standard Guestrooms, 13 Executive Suites, as well as the 12th Floor Executive Lounge. A full purchasing package was provided, as well as a detailed budget breakdown of both the construction and FF&E scope. 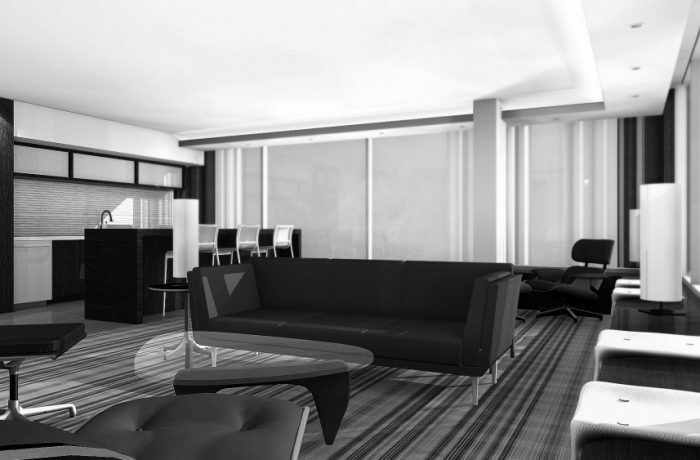 The 1,200 sf Prime Minister's Suite, was the feature of the design package. WGD presented the client with two budgeted design options for the Suites. In both Option A and Option B the custom built-in furnishings and millwork allowed for the existing space to be maximized . Opting for a sleek and modern design approach, Option A was ultimately identified as the client favourite, featuring the iconic Eames Lounge Chair and Ottoman, as well as the Noguchi Table. Option B provided a more traditional feel, taking from the style proposed for the standard guestrooms.